The Australian Cattle Dog is generally a very health, resilient breed, but there are some health issues associated with these dogs. Always be sure to ask about any health issues and don't hesitate to ask to see certifications or registry records on breeding stock. Be aware of those that say they do not do testing, giving excuses like it is not available or breed clubs do not sanction testing. Every ethical breeder should at least have their breeding stock tested and certified clear for hip/elbow dysplasia, hearing, Progressive Retinal Atrophy (PRA) and Primary Lens Luxation (PLL). Puppies should be hearing tested. Deafness: Due to the Dalmatian infusion when the breed was first being developed, the cattle dog can be prone to deafness. Genetic deafness occurs when ACD pups are just a couple of weeks old. Puppies don't develop hearing until they are about 10 days old, it is not long after this that genetic deafness occurs. 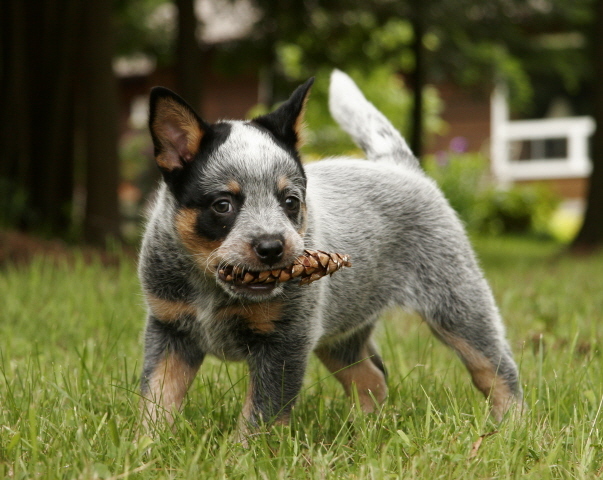 An ACD can be unilaterally (one ear) or bilaterally (two ears) deaf. That it is why it is important to have all breeding stock tested and to ensure that all pups are tested at about six weeks of age. It is impossible to tell if a pup is unilaterally deaf unless tested. The test is called the Brain Evoked Audio Response (BAER). A unilaterally deaf dog can lead a very normal life and quite often you would never know, but it is still important to recognize and understand the impairment. A dog that is deaf in one ear would not be well suited as a working farm dog. A totally deaf dog can also lead a normal life, but requires a lot of patience, understanding and love. There are many very successful methods of teaching a totally deaf dog how to cope. Hip/Elbow Dysplasia: Although hip/elbow dysplasia is not really prevalent in the breed, it can happen. Therefore it is valuable to have all breeding stock x-rayed. Hip/elbow dysplasia is inherited, but it is also very much influenced by environmental factors. i.e poor diet, over exercising of young dogs, overweight dogs. Canadian hip certification usd to be performed by the Ontario Veterinary College (OVC) when the dog is 18 months of age, however they are no longer doing assessments. We now use our American counterpart, Orthopedic Foundation for Animals (OFA) which requires certification a 2 years of age. Progressive Retinal Atrophy (PRA): The two forms of inherited PRA known in the ACD are the prcd (progressive rod-cone degeneration) and the rcd4 form of PRA. It is the main eye abnormality with this breed. A dog that has tested normal or clear will never develop this form of PRA. There is now DNA testing that enables us to determine if a dog is clear, a carrier or affected. It is very important to us to ensure that we only produce pups that will not be affected by the disease. A carrier will not be affected with the disease, however if bred to another carrier or an affected dog, a percentage of pups in a litter will develop the disease. The prcd form usually shows symptoms from 5 to 6 years of age, but may show up as early as 3 years old. The rcd4 form shows symptoms much later in life starting at 9-10 years of age. Primary Lens Luxation (PLL): Primary lens luxation is another eye disease that is known to have affected the Australian Cattle Dog. Similar to PRA, we now have a DNA test that enables us to determine if the dog is clear, carrier or affected. This luxation happens when fibres connected to the lens, stretch or break resulting in the lens to fall out of place. The typical onset for PLL to occur is between 4 and 8 years of age. Luxation of a lens can also happen due to trauma, so it's important to know the status of our breeding stock. We also test for the following diseases, of which all our current dogs used in our breeding program are clear. Having the dog's eyes examined by an ophthalmologist on a regular basis for other possible abnormalities is also recommended for dogs used in a breeding progam. This is known as a CERF examination. It is very important to have all breeding dogs tested!